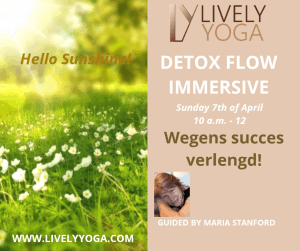 Let’s celebrate Spring with a DeTox Flow Immersive to relieve emotional stress and or depression and help with tight muscles and an achy body. Guided by Maria Stanford. This deep, immersive class is designed to help detoxify the tissues and organs of the body, while allowing for more flexibility in the bones and muscles. You will feel more energized and spacious in your body and spirit. We start with a vinyasa flow to build the inner fire and help move energy more freely in your body. This will include twists which are greatly effective to wring out the internal organs. Then we will do some core work to help the digestive system and strengthen the back. Finally, we finish with deep hip openers to clear the pelvis and boost the immune system. This will be a deeply cleansing and immersive class for the mind body and soul. The class will held in an infrared heated room. The panels feature of long waves infrared, which has the great effort to warm-up the body from the deeper layers as well offers the infrared panels a therapeutic healing for the body and soul. Maria Stanford will host this Detox Flow Immersive class. She has been teaching a variety of yoga classes for over 18 years in San Francisco. Maria is trained & certified in many yoga & meditation practices and during this immersive class she will diving into detoxing the tissues and the organs to feel more energized.